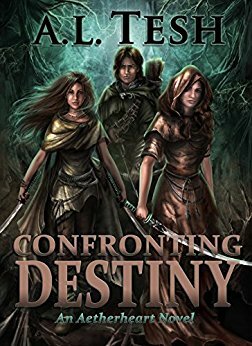 Confronting Destiny is a fantasy novel by self-published author A.L. Tesh following the story of two young cousins, Kaleen, Melena as they learn to hone their respective skills and prepare for an upcoming battle against the Karogs, a rival Kingdom. Like all good characters in a fantasy novel, the girls each have their own special abilities; both are remarkable fencers, Melena is part elf, giving her extra agility and fine-tuned senses, and Kaleen has an inborn ability to control the aether, a force much like that in Star Wars. Kaleen also happens to be a reluctant future Queen, struggling with the decision to rule her realm or keep her freedom. Pros: I thought that the story line was a decent one, and I enjoyed the combat scenes and the general plot. There were a rich variety of characters and scenery and I particularly appreciated the headstrong quality of the two female leads. Cons: Sometimes the story-line is vague and hard to follow, probably due to the author’s use of language; sometimes grammar and syntax leave something to be desire, and redundancies are frequent. The author could also work a little on character building as one character tends to feel the same as the next, making it difficult to remember who is in which role. All in all I would give Confronting Destiny kudos for content, but not so much for the organization and execution of the the book as a whole. Once I got past it’s downfalls, however, I DID find myself engaged in the story-line. With some solid editing, I feel that this is an epic well worth the read and I hope that A.L. Tesh does not give up on writing any time soon! Guest review contributed by MetaPhysicalPen. This blogger posts short stories, book excerpts, writing advice, and book reviews for different genres.